Former Gov. Babangida Aliyu Spits fire, Tells Gov Bello Fault Us with Facts or Shut Up! 03/06/2018 03/06/2018 adminNewsNo Comment on Former Gov. Babangida Aliyu Spits fire, Tells Gov Bello Fault Us with Facts or Shut Up! 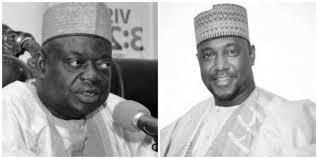 The immediate past Governor of Niger State, Dr Mu’azu Babangida Aliyu has challenged his successor in office, Governor Abubakar Sani Bello to fault the past administration’s record of achievements with facts instead of feeding the people of the state with outright lies and cheap sentiments. Reacting to Governor Bello’s allegation of impropriety in the execution of key projects initiated by the Babangida Aliyu-led Peoples Democratic Party (PDP) administration in the state, the former governor described the criticism by the incumbent as ‘idle talk” that cannot be substantiated. Governor Bello had on May 29, 2018 told media practitioners in the state that his predecessors, especially, ex-Governor Babangida Aliyu was to blame for the sorry state of infrastructure in the state, emphasizing that the PDP administration he succeeded indulged in wasteful spending. But Babangida Aliyu’s response which is contained in a press statement signed by his Media Assistant, Mr. Israel Ebije Ayegba dismissed the allegation as false. The former governor said the issues which Governor Bello rushes to press with are ones that he could find answers to if he cared to read the handover notes given to him at the expiration of the tenure of the immediate past administration in the state. The statement said the kind of false accusations being heaped on the immediate past PDP administration by the incumbent can only come from an inept administration that has nothing to show for its being in power for three years. It said: “Through unwarranted allegations, the ruling APC administration in Niger State is merely trying to give the impression that every past administration in the state was as clueless as the incumbent”. “While we agree that the ruling APC administration in Niger State reserves the right to raise issues about its predecessors’ performances in office, we must say that the party in power lacks the moral justification to turn itself into a perpetual blackmailer of its precursors even when it finds it difficult to substantiate its allegations,” the statement added. Ayegba said while former Governor Babangida Aliyu does not intend to abridge the right of his successor to raise issues on any project, policy or programmes executed between 2007 and 2015, he cautioned that blackmailing Dr. Babangida Aliyu is not in any way synonymous with good governance or delivering the dividends of democracy.